If bumping your head could be 100% guaranteed to only result in a small discomfort and nothing more, then yes it could be a useful learning tool. If a baby can learn from pain, then she certainly wouldn't be able to put that knowledge into practise right away, as her body couldn't develop fast enough to! Did you learn to ride a bicycle or ice skate without falling a good few times? It takes time and practice to perfect balance and there's to point rushing it. But, you can make it a safer, better experience. If it takes pain to gain knowledge then scraped hands when falling over can be an acceptable form of learning for a child and thankfully it is non-life threatening. This pain will still get the message across to the child that falling over does not feel good. 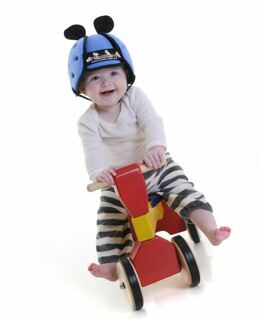 It is a traumatic experience for all the family when a baby is taken to hospital with a head injury. When asked, medical staff said that, "thankfully, most children go home with just a small bruise but people are fraught because of their child's trauma and worry about the effects of their child being exposed to the radiation of the X-ray. Sometimes it's the shock of the wound receiving sutures and having to hold their baby still. There is also the worrying 24-hour observation period, not to mention the family arguing and the accusations of who it was that had failed to catch the child in time in the first place. It very rarely gets more serious than this but sometimes that's enough."